“Cancel Christmas” – When a suspected North Korean spy is poisoned and hit by a truck carrying Christmas trees, the team must search for who is responsible for smuggling spies into the country. Also, Deeks and Kensi try to find a way to include their mothers in their Christmas plans, and Hetty notices that Granger isn’t feeling the holiday cheer, on NCIS: LOS ANGELES, Monday, Dec. 14 (9:59-11:00 PM, ET/PT), on the CBS Television Network. This is replacing episode 7×8 Defectors out of respect for the people of France. (The episode’s writer twitter it will not effect story continuity.) We will be sure to let you know when Episode 8 Defectors is set to air again. 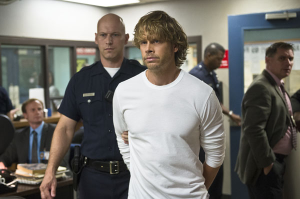 “Internal Affairs” – While Deeks is under arrest and interrogated for the murder of his former partner, the team races to try and prove his innocence, on NCIS: LOS ANGELES, Monday, Nov. 23 (9:59-11:00 PM, ET/PT), on the CBS Television Network. “Defectors” – The team searches for a missing teenage girl who is feared to have been recruited by a terrorist organization, on NCIS: LOS ANGELES, Monday, Nov. 16 (9:59-11:00 PM, ET/PT), on the CBS Television Network. “An Unlocked Mind” – Kensi and Deeks go undercover as cult members to rescue a former Department of Defense employee brainwashed into revealing classified information, as the rest of the team works to prevent the cult from selling the government secrets, on NCIS: LOS ANGELES, Monday, Nov. 9 (9:59-11:00 PM, ET/PT), on the CBS Television Network. 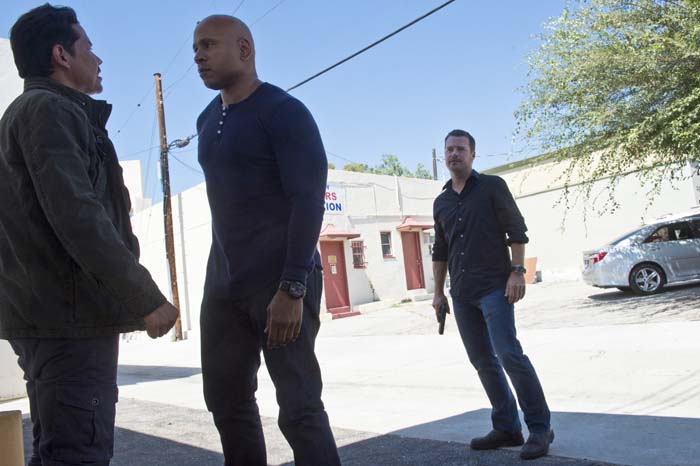 “Unspoken” – The team searches for Sam’s former partner, Ruiz (Anthony Ruivivar), who disappears while buying a deadly explosive during an undercover operation, on NCIS: LOS ANGELES, Monday, Nov. 2 (10:00-11:00 PM, ET/PT), on the CBS Television Network.